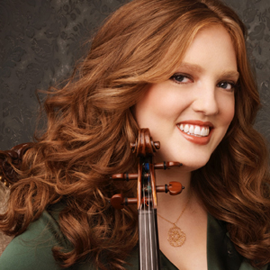 In both art and life, violinist RACHEL BARTON PINE has an extraordinary ability to connect with people. Celebrated as a great interpreter of classical works, her performances combine her innate gift for emotional communication and her scholarly fascination with historical research. She plays with passion and conviction across an extensive repertoire. Audiences are thrilled by her dazzling technique, lustrous tone, and infectious joy in music-making. Pine has appeared as a soloist with many of North Americas most prestigious ensembles, including the Chicago, Montreal, Atlanta, San Diego, Baltimore, St. Louis and Dallas Symphonies; Buffalo and Rochester Philharmonics, and the Philadelphia and Louisville Orchestras. Overseas, she has performed with the Vienna, New Zealand, Iceland and Budapest Symphonies; the Royal Scottish and Belgian National Orchestras; the Mozarteum, Scottish and Israel Chamber Orchestras; the Royal, Calgary and Russian Philharmonics, and the Netherlands Radio Kamer Filharmonie. She has worked with such renowned conductors as Charles Dutoit, John Nelson, Zubin Mehta, Erich Leinsdorf, Neeme Järvi, Marin Alsop, Placido Domingo and Semyon Bychkov. Pine is an avid performer of baroque, renaissance and medieval music on baroque violin, viola damore, renaissance violin, and rebec. She regularly performs and records with John Mark Rozendaal and David Schrader as the period instrument ensemble Trio Settecento. In fall 2012 Trio Settecento releases An English Fancy on Cedille Records, following up previous installments A French Soirée, An Italian Sojourn, and A German Bouquet, which highlight and celebrate music from the age of Enlightenment. Trio Settecento has played at The Frick Collection, Brome Beaux Arts, Columbia Universitys Miller Theatre, Dumbarton Oaks, the Boston Early Music Festival and Houston Early Music. She was a torchbearer in the 1996 Olympic torch relay and that same year performed at the Democratic National Convention. She has been featured on CBS Sunday Morning, appeared five times on NBCs Today Show, and frequently has been a guest on nationally-syndicated radio shows including Performance Today and From the Top. Recent cover stories include Strad, Strings and International Musician. She performs on the Joseph Guarnerius del Gesu (Cremona 1742), known as the ex-Soldat, on generous loan from her patron.